It is with regret that we have to inform you of the death of Noelle Roberts (Godfrey). Noelle passed away on 24th December 2016. 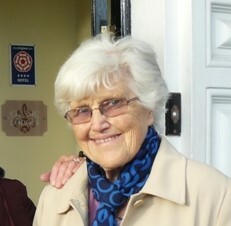 She was a stalwart of the Association being an ‘ever present’ at many of the reunions along with Gillian Smallwood and Barbara Abrey who were also 49ers. She was the Set Rep for 1949 and in her annual reports never failed to mention her thanks to the Committee for all their work in organising reunions. I think we can all identify with that!